Apple's space gray color option for iPhones could return to a darker shade, closer to black with the upcoming "iPhone 7," according to a new report. Space gray iPhone 5s vs black and slate iPhone 5. Via Mike Cronin. Citing his own sources, Danbo of Macotakara reached out to AppleInsider on Monday to indicate that Apple is expected to offer the "iPhone 7" in a "much darker color" than the current space gray option found on the iPhone 6s series. Tipsters apparently indicated that the new, darker shade of iPhone will be close to black, though not quite black. 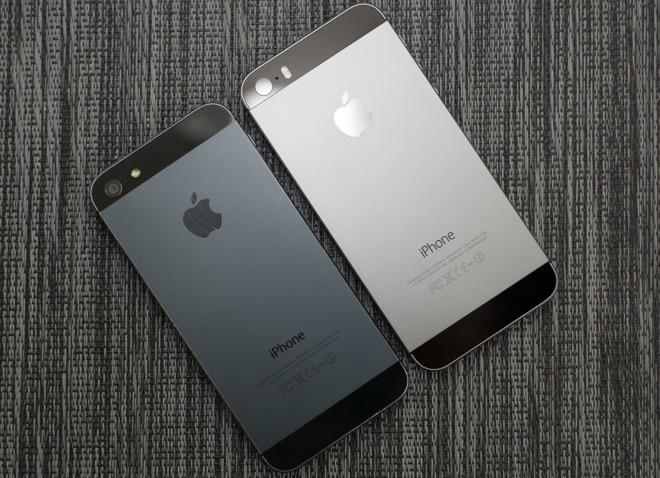 Apple previously offered the iPhone 5 in a black and slate color that was much darker than the current space gray options. Space gray was first introduced with the iPhone 5s in 2013. Though Apple uses the same space gray branding for different products, the color is far from consistent. For example, the space gray found on the Apple Watch Sport is a darker shade than the Series 7000 aluminum used on the space gray iPhone 6s. Apple also offers a "space black" stainless steel Apple Watch, which itself is darker than the space gray sport model. Monday's indications from Macotakara sources appear to be a clarification from earlier reports that suggested Apple would ditch space gray for a "deep blue" color option. Sources who claim to have seen the next-generation iPhone coloring apparently mistook the darker space gray for a blue shade. In addition to space gray, the iPhone lineup also comes in silver, gold, and rose gold. It's expected that all four of those colors will remain for the next-generation "iPhone 7." Rumors and parts leaks point to a largely unchanged chassis design, expected to ditch the 3.5mm headphone jack. Internally, the device is rumored to have an upgraded "A10" processor, a 256-gigabyte storage tier, and an all-new dual-lens camera system for the larger "iPhone 7 Plus" variant.